A home energy rating is an analysis of a new or existing home’s estimated energy efficiency. The Home Energy Rating System (HERS®) Index, developed by the Residential Energy Services Network (RESNET®) and introduced in 2006, is the most commonly used index or scoring system used to reflect a home’s estimated energy efficiency. Government agencies such as the Department of Energy (DOE), Department of Housing and Urban Development (HUD) and the Environmental Protection Agency (EPA) recognize HERS Index as an official verification for their programs or tax credits. The HERS Rater or RFI then enters the data into approved energy efficiency software, which performs an energy simulation based on the home’s intended or current condition. 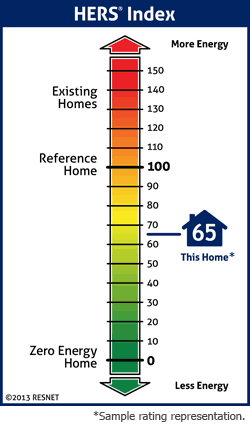 The HERS Index is a comparison of a home in question to the RESNET Reference Home. The Reference Home is generated through special software using the specifications of the home being compared (size, shape, design, geometric configuration, location and type, among others) in order to give a more accurate comparison. The lower a home’s HERS Index score, the more energy efficient it is in comparison to the HERS Reference Home. Each one-point increase or decrease in the HERS Index corresponds to an approximate 1 percent increase or decrease in estimated energy consumption compared to the HERS Reference Home. Thus, a home with a HERS Index score of 105 consumes approximately 5 percent more energy than the HERS Reference Home, and a home with a HERS Index of 95 uses approximately 5 percent less energy than the “Reference Home”. The HERS Index is based on estimated energy usage and should not be considered a guarantee of a home’s actual performance. Typically, the HERS Rater or RFI will provide recommendations to improve the energy efficiency of a home. These recommendations are then used to generate a projected HERS Index score, reflecting the homes potential improved condition. After implementation of the recommendations and a second analysis of the home, the HERS Rater or RFI can issue a new, final HERS Index score. As of September 1, 2016, the Texas statewide minimum energy code for residential construction has changed to the 2015 International Residential Code (IRC), Chapter 11, or 2015 International Energy Conservation Code (IECC), which is 30 percent better than the IECC 2006. With this in mind, savings may be considerably less when comparing homes built to the more stringent codes. 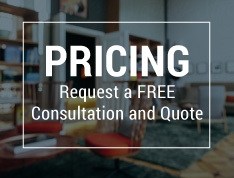 The Texas option for compliance using the Energy Rating Index (ERI) now includes a set of ERI values that differ from those published in the 2015 versions of the respective codes. The ERI values will decrease (become more stringent) every three years until September 1, 2022. The first table below indicates the original ERI values as published in the 2015 IECC/IRC. The second table indicates the adjusted Texas ERI values and dates of compliance, per Texas 84th Legislatures HB 1736 and published in the Texas Health and Safety Code Section 388.003 (b-1).